What should be my last UFO of 2015 is on the design wall today. It's "Aunt Sukey's Sampler" from "Five is Fabulous" by Marti Michell. 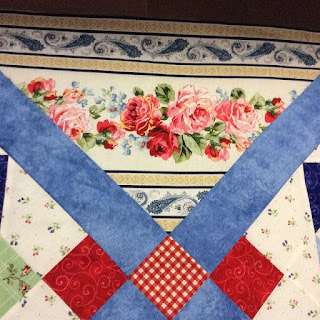 This was the 2014 "Block of the Month" project at Ruth's Stitchery. As with many UFOs. now that it is nearly finished, I could kick myself for taking so long to finish it! As soon as I finished the last block, I put all the blocks on the design wall. And fell in love! Every bit I added to this quilt, I liked it more. And now that there is just the last border (the medium blue), I can't wait to get it to the quilter and onto my bed. I especially love the tiny gingham checks in the setting blocks and cornerstones. Most of the other fabrics are from Maywood. Shoot, I cut off the selvedge identifier when I cut the setting triangles. And I must have trashed it back then, because I don't have any left. I don't know who the manufacturer of this pretty border fabric is -- but I do know I bought it at High Prairie Quilts in Parker. They still had some left last week when I stopped by on my way to the airport to pick up my co-author. My 2015 UFO list has 15 projects on it. And only TWO have been crossed off! How is your UFO list looking? 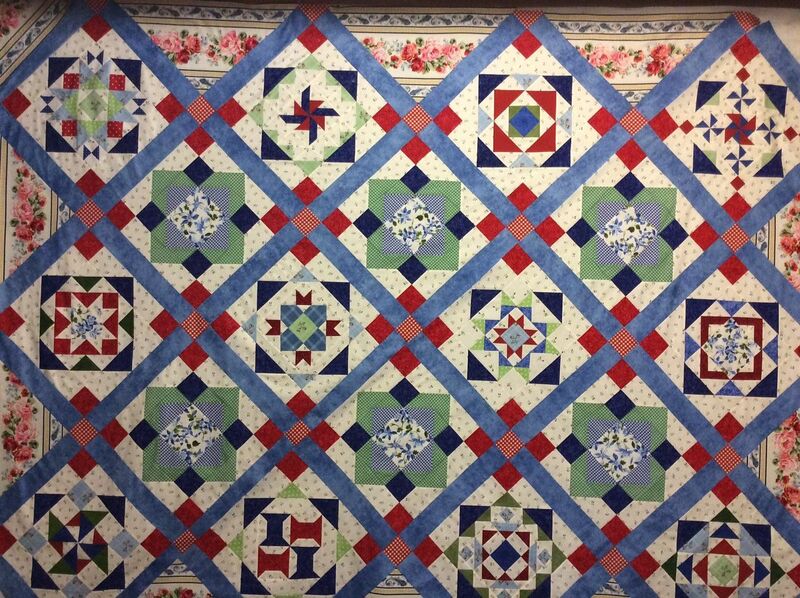 Come back tomorrow to see the new "A Quilt Block a Day." I promise, it's an easy one! It`s just fantastic and love your fabric combo.Congratulations!! Wishing you a wonderful Merry Christmas! Oh my goodness, I love the border print used as setting triangles! 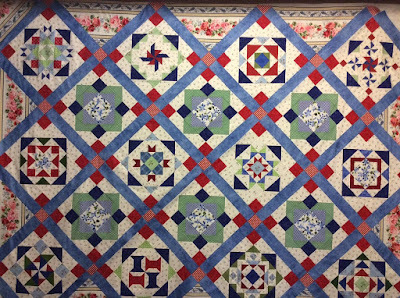 Great colors and a gorgeous quilt! I love the colors in this. I have a few border prints, hmmmm. Your quilt is lovely! No wonder you're glad to finish it! I am working hard on getting my November UFO done before Christmas or at least to the flimsy state. 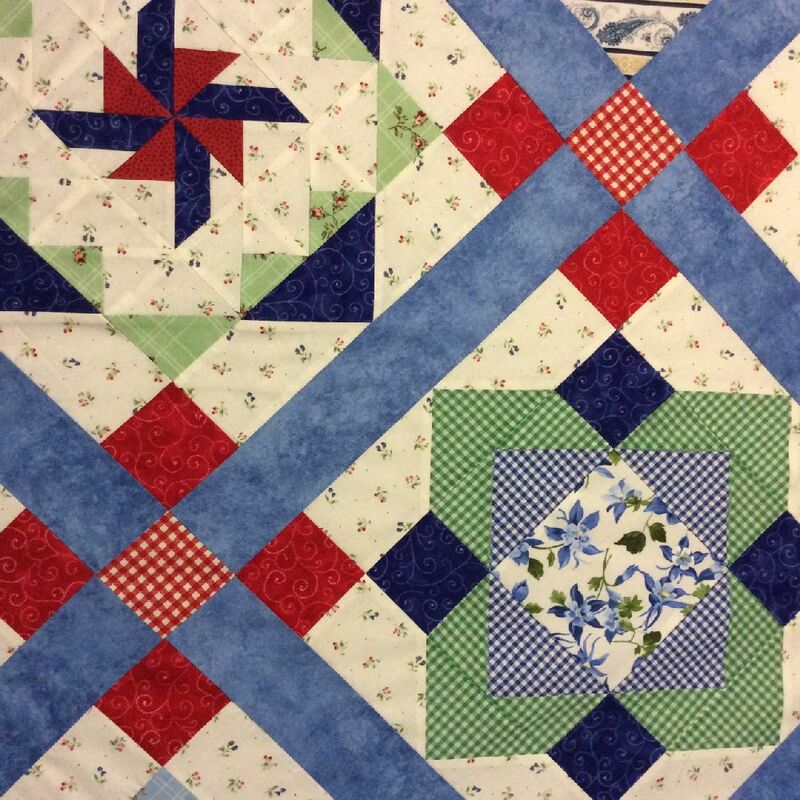 That is how it is going to be given to my daughter until my quilter can quilt it. That will mean that I have gotten 11 of my 12 UFO's done for 2015. I am hoping to actually get the last one a little closer to done. I am already starting my 2016 list. Yes I still have more UFO's. I finish things but I add new projects too, so my UFO list never seems to shrink. 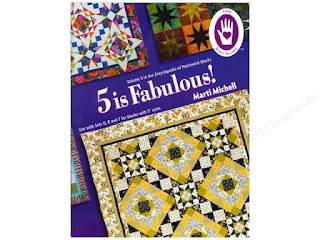 I love the layout of this – the setting blocks and sashing. The repetition of certain elements really ties everything together so well.